Best lightweight web browsers for Android are way better than any normal browser for surfing. Because they are fast, eat less battery, lightweight and support better. You probably felt lags while using such heavy browsers like Google Chrome, Firefox, UC Browser, Opera browser, Microsoft Edge and more. And the worse thing is some of the browsers that I mentioned comes inbuilt in most of the Android. Means you can hardly remove it. I understand your frustration of lag on Browsers. 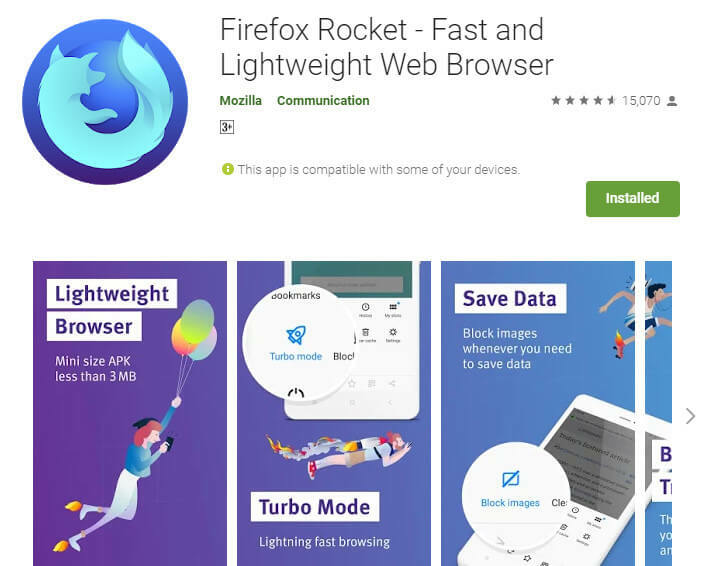 You are not alone here, almost all the Android users frustrated by this and that’s why today I’m here to give you the best lightweight web browsers suggestion. Some old Android users reported that they even can’t access the Browsers after updating it to the latest version. The reason is the browsers for Android are becoming more advance that requires next level hardware. So, whenever you update your Android browser it little bit get updated in the hardware term too. So, let me clear you very honestly everything right here because I don’t want my readers to know half information about this topic. 0.1 What is Lightweight Web Browsers? What is Lightweight Web Browsers? These browsers are less in size, consume less battery, run fast, saves storage and more. Basically, lightweight web browsers build for low specification mobiles to deliver the fastest experience. They only render the required pieces of stuff like Search result without ads, without pop-ups. Their main aim is to deliver the fast user experience without any barrier. Lite web browsers are different than normal web browsers. Let me explain it too. Lite web browsers are less in disadvantage than normal web browsers. However, if you look at the factors seriously you will find some huge difference that really impacts. Factors like Surfing Speed, RAM usage, Storage Taken, Battery Drainage, etc. Surfing Speed: In Lite browsers, it is good as compared to normal web browsers. Because the lite browsers are customized to show only required request (Result without the barrier). In other words, it only shows what users want. RAM Usage: Lite Browsers have usually low RAM usage because they are lite, have fewer functions. And on the other hand, normal web browsers have huge RAM required around 300-400Mb alone. That’s huge! right? Storage Taken: Normal Android browsers usually takes more storage than lightweight web browsers because it has too many functions. Battery Drainage: Because of the little amount of function in the lightweight web browsers, it consumes less battery than a normal web browser. Now, I think I pretty much explained to you about the lightweight web browser, the difference between normal and lite. 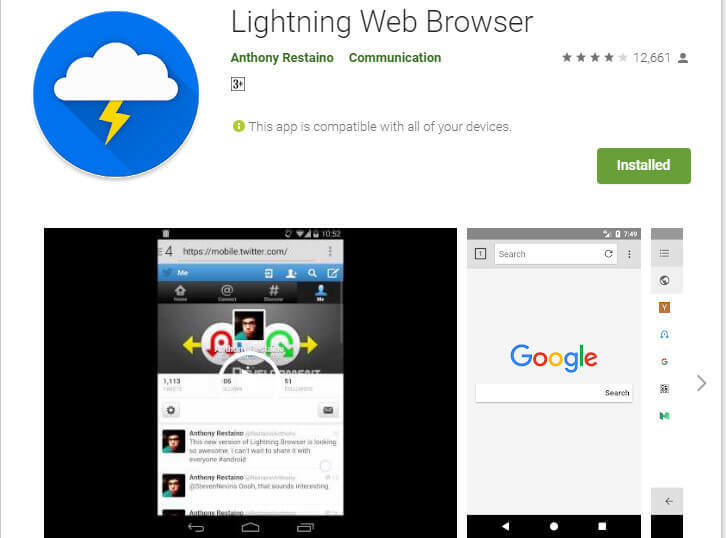 So, today I have 9 best lightweight web browsers for your low-end phone. Adopting these browsers will increase your surfing user experience drastically. If you really want such a great lightweight web browser, nothing is better for you than Google Go. It shows search result instantly while you type that no browser does in the market. Moreover, it customized in a way to deliver the best user experience. All the popular sites are pre-placed in the home. It means you don’t have to waste the time to search for those popular sites. In Google Go settings, you can do more data savings by just enabling a setting called “use light web pages”. You can also customize some kind of stuff like app background, wallpaper, etc. I must recommend this to try. Always looking for a simple web browser? Via browser may stop your research because its the one, simple lightweight web browser. In via browser you will get only the search bar to search, no useless stuff. Most web browsers make their home section filled with stuff that doesn’t make sense for users. Basically, they make their home filled with stuff to earn money from those site by putting affiliate links. But via browser think for its audience first! And that’s why I loved it. Well, Via browser has plenty of option to give better support. Like it has a downloading feature, desktop site, tools, incognito, night mode and more. And the best part of this browser is it has add-ons features. Means you can enable plugins, it has two inbuilt add-ons first download manager and second QR code scan. You should try this if you want a lite browser with the ton of features. The lite version of UC browser has done a great job. A work that everybody wants, a well downloading browser. Yes, it is true that UC is best in downloading files and multimedia. You probably noticed it before. But it also has the ton of disadvantage like fake news, bad kind of new and stuff like that. 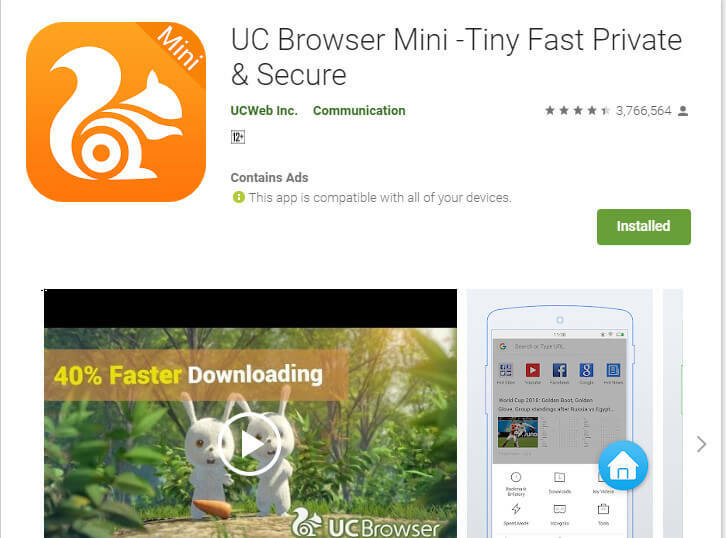 But with UC mini you can take such advantages as speed surfing and files downloading, incognito, tools included data saver, QR code scanner, full screen, night mode, etc. It cost your storage less but give you more. Give it a try! If you surf the internet means you know the opera. Its the fastest browser ever I meet. 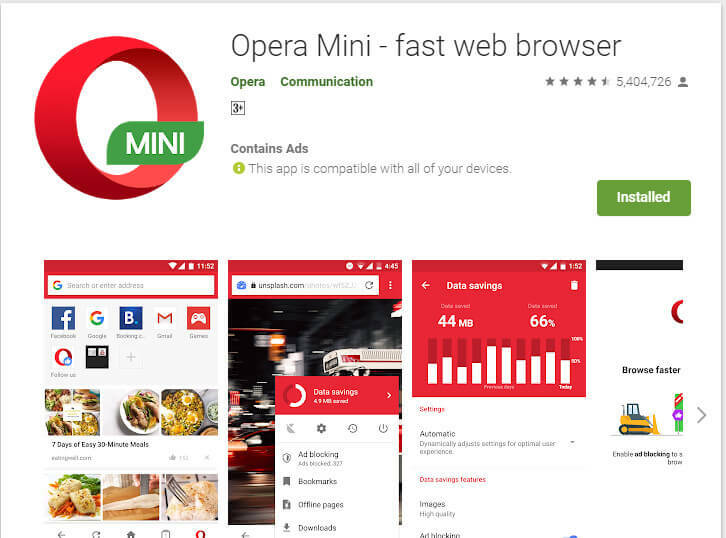 In opera mini, you got plenty of speed, less battery drainage, tools and more. And it also famous for data saving and ad blocking. Both these features are good and its all inbuilt in it. That’s awesome! Right? Well, it one disadvantage which you absolutely have to know because I want to show a real mirror. It has bad downloading speed as compare to UC min. Look be honest with you, no browser is perfect! But this one has something new and you must try this. Hermit is totally different than any lite web browser. However, it creates the app of the web pages that loads super fast. It’s superb! 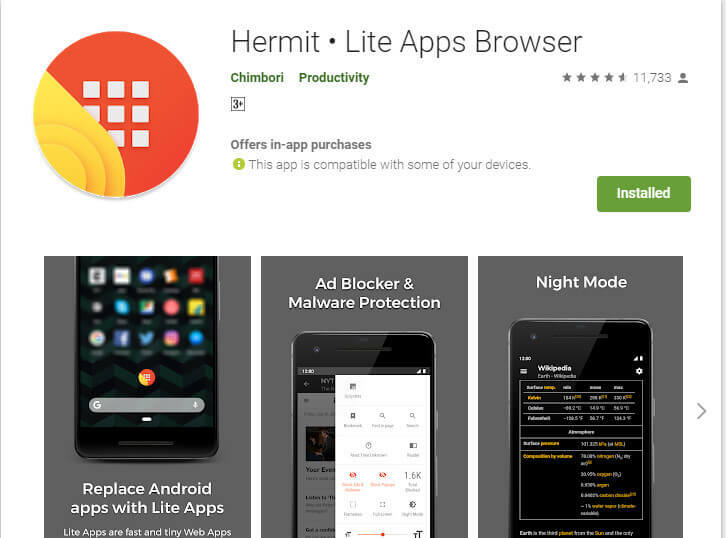 With hermit lite browser you can open any complex web page by creating the app version of it. To create the app version of any web page you have to open the app and click on create button. After, go to Create your own then type the URL and finally click on create to create the app version of it. And after that, you can access that web page with super speed from the home. Apart from this, you can also do search normally like others. Love the Du products? 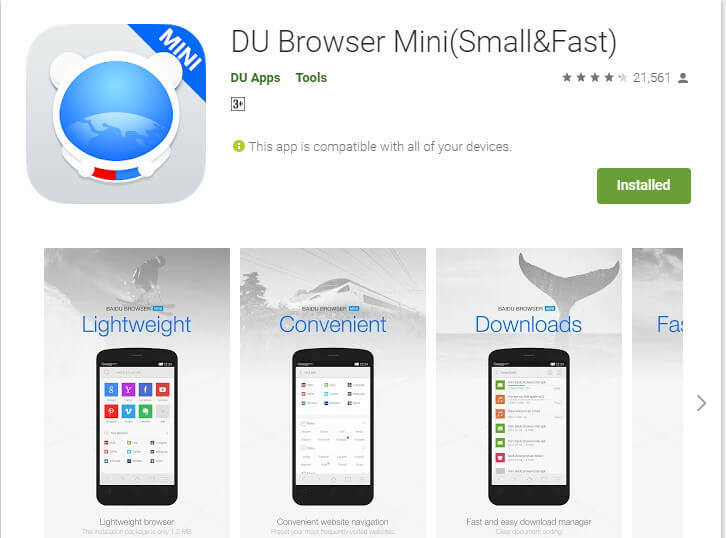 This Du browser mini will increase the love towards Du product. It has a well-customized layout for its users that enable engagement. The icon of big sites that are listed on it is big which is good for users. They are more likely to click on it instead of search for it. Another thing I liked about its layout is, all the section are well labeled. This will help users to easily navigate through. It also has forward and backward buttons which are unique in a lite browser. 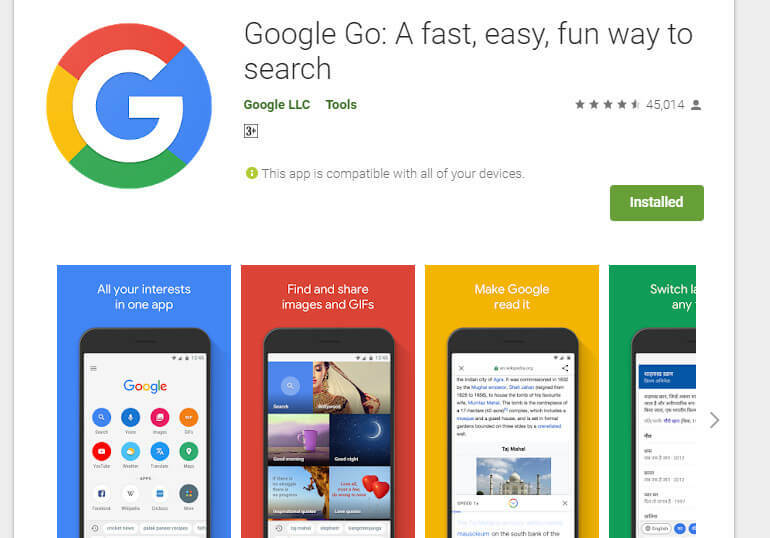 Apart from its layout, there are plenty of features are added like incognito, text only searching, personalized settings and more. The name of this lite browser describing it. Yes, it’s really lightweight, reader-friendly and fast. The reader-friendly feature is unique in this lite browser. And this feature works great anytime. To enable it, just visit any web by searching through the app, click on the three dots then click on reader mode. And that’s it. The light will become little yellow which make you read easily. Apart from this unique feature, its all the features are similar to normal web browsers. I highly recommend using this lite web browser over any browser if you are a strong reader. Firefox Rocket is a very good example of a best lightweight web browser. Because it’s very lite and fast. It has a turbo Mode feature that blocks all the unnecessary requests from web pages and renders which is useful to users. And when the turbo mode gets On, the internet data requirement also gets reduced. Meanwhile, it saves 3x data in turbo mode. Quite amazing! Right? Firefox has also a unique feature that no browser providing even popular web browser is screenshots function. Firefox Rocket added screenshot feature in the there menu section. With this feature, you can take a screenshot of the entire web page with a tap. Another feature I liked in Firefox rocket is instant clear cache. Almost all the lightweight web browser caches storage when it runs and those caches get stores and start consuming most of the space from the phone. Yes, you can instantly fix storage space problem by clearing cache but to do that you have to go settings and that’s quite frustrating. But in Firefox Rocket, you can clear its cache in one tap from the menu section. And this will save your time too. It is the best lightweight simple browser with auto data saving system. Aloha browser lite have a cute lite interface that usually contained useful kinds of stuff like the search bar, site suggestion, trends, etc. Aloha browser lite has QR-code scanner that scans QR-code and acts on it. This is the best and unique feature I liked about Aloha browser lite. It has bing search engine by default but the best thing about Aloha browser lite is it has a huge list of the search engines to select and make default. Usually, on most browser, only one search engine has listed. Which we probably don’t like. Well, Aloha browser lite had cared about this and has listed 8+ Search engine options to adopt or make default. The other thing that most browsers don’t do is they don’t give us control to customize the appearance. 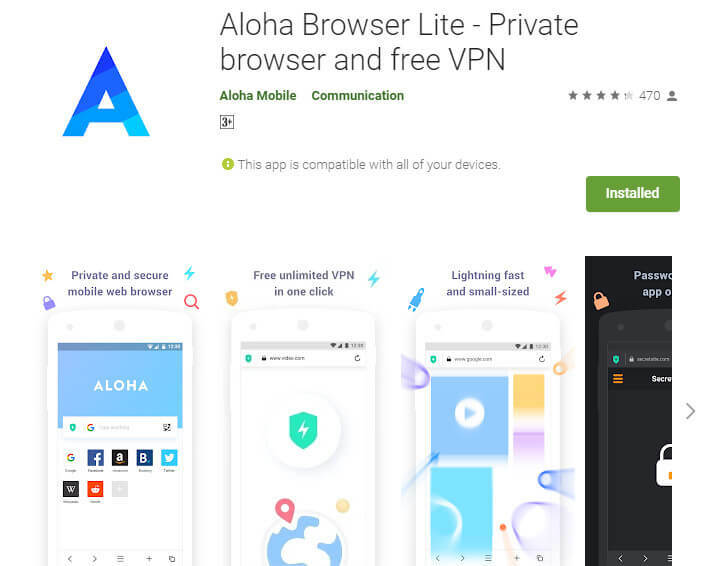 Aloha browser lite has done it for us. From the settings, you can customize every element that appears in the starting page like feeds, background Theme, etc. Apart from its sincereness, it has night mode feature that works amazing. It is really well customized for the night session. The brightness is really optimized for eyes. Overall, it is the best lightweight web browser for Android. It saves data, runs fast, and eat less battery. All the lightweight web browsers that I listed above offers something new and unique. 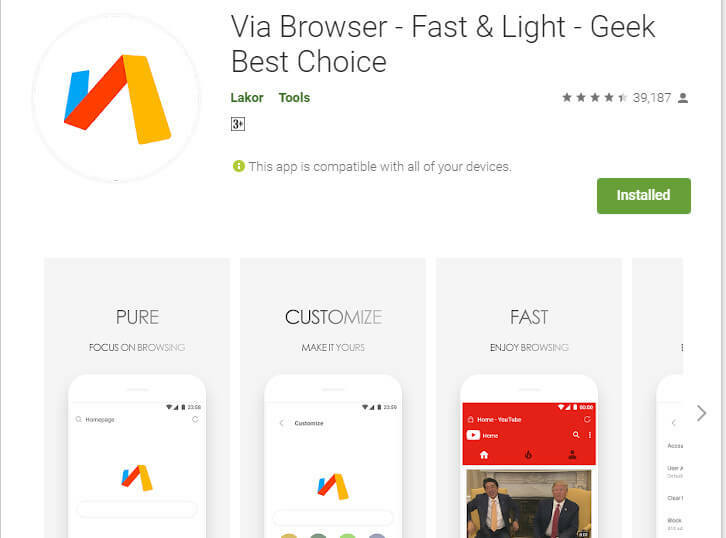 So, if you really want to get a good browser for your old/new phone then try all one by one. Because you will get experience by trying it, not by just reading. If you still need my authentic suggestion then let me tell one thing. These all listed lightweight web browsers are priorities accordingly. Means from top to bottom you will find the best lightweight browsers. Again try all of them and choose one that standouts on your Android. So, I hope you liked this post? If so, please comment and also drop your own opinion towards these best lightweight web browsers for Android. information shared is valuable, all the browser are very well known.